Now I know it's almost impossible to believe — yes, it's shocking, it's astounding, but nevertheless it's true — the Gospel that Jesus brought to mankind was lost to our Western world within the first two or three centuries, way back there nineteen hundred years ago! And we have seen how the apostle Paul in the book that we call Romans in the New Testament in which was really his letter that he sent to the Church at Rome to those people that were the converts both Jewish and Gentile at Rome; and how first he showed the Gentiles that they had no basis for their prejudice. They supposed they were superior because all of the great men, the great philosophers, yes — and the great captains of industry and in government and affairs of men in the world were Gentiles so they felt that they were superior, and they looked down on the Jewish people. But the Jews felt they were superior because they had the law of God and theirs were the covenants and the promises of God all pertaining to them. And as the apostle Paul said when he wrote them the letter to the Jew first; but also to the Gentile. Well, he showed the Gentiles how their great leaders had not retained God in their knowledge and how they were condemned, even if they didn't have the law of God, when they violated His principles just the same. Then to the Jews he said; you have the law, you try to teach the Gentiles, you look down on them. But you break it, and you violate the law just the same as they do. Who are you that tries to teach another and won't practice what you preach? So, he whittled them down to their size too. That was one of the fundamental causes — the prejudice between Jewish and Gentile Christians that were converts in the early Church that set up a great prejudice one against the other. So, prophesying a popular universal falling away from the faith once delivered to the Thessalonians, Paul had stated here in II Thessalonians the second chapter: "...the mystery of iniquity doth already work..." (II Thessalonians 2:7). And that was only some thirty years after the Church had begun and after the crucifixion and the resurrection of Christ. He referred to the very Chaldean mysteries that were popular in the pagan world that dominated the world at that time. Yes, the Chaldean mysteries of which two annual festivals; Easter and the one that had come to be called Christmas that was based around the January calends and the time around the twenty-fifth of December, were the two chief festivals — believe it or not. Now that is in almost any ancient history, any history that you want to pick up, my friends; and you can get the truth at any public library. Now, this is the very fact, my friends, that the world does not realize today; it does not realize that in the New Testament prophecy two groups of professing Christians are described, not just one great popular kind of a Church that might be divided in many denominations and divisions — but two groups of professing Christians. One was great and the other was small. One was to become great and powerful, politically organized; a part of this world. And brought to concrete focus in Revelation chapter 17 — where God calls that group of Christians by a very ugly name — 'apostate'. But where then is the True Church? Jesus said; "...I will build my church..." (Matthew 16:18). Did He? Where is it? Did the true Church of God, of which Jesus Christ is the Living Directing Head become perverted? 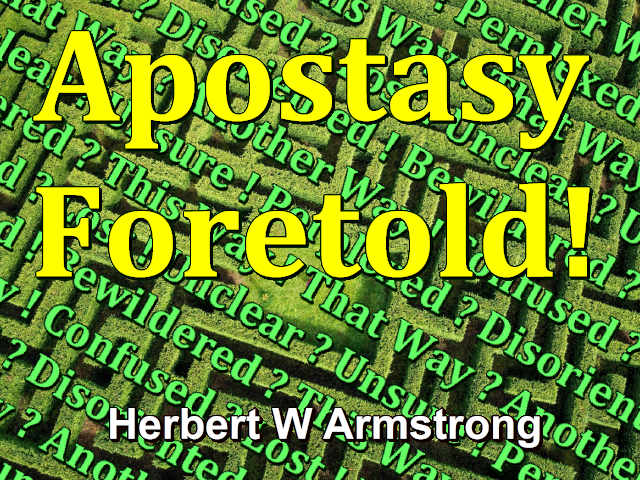 Now did it apostatize into the system that I have been talking about, the system that is foretold in the Bible? Did the true Church apostatize, go clear away from the truth, completely degenerate — and then later come back and reform again, or something of that sort? Oh no my friends, the gates of hell have never prevailed against the true Church of God and never will. The true Church has never fallen; it couldn't be the Church when it falls. Listen, the true Church, the real Church of God, the Church of which Jesus is the Head, the Church Jesus that Himself founded, is composed of what? It isn't a physical organization of people, it isn't a political organization; it is a spiritual organism. And it is composed of those people who have completely given up their way and turned to the Way of God, who have repented of their own way. Who have accepted Christ, not only as just Savior on the outside and someone to profess; but as the Living Savior who comes within and lives His life within their own minds and hearts. Who have actually given up their own way; who have completely surrendered to God and who are now led by the Spirit of God. And who live as Jesus said they must — by every word of God. Now God's own people have the laws of God, the ways of God, the very mind of God written right down in their hearts. It isn't a matter of maudlin sentimentality and worked up physical emotion but is real spirituality. People who have really surrendered their way, people who are willing to be corrected by God and by the Word of God. Who are searching the Word of God, studying the Word of God, to know how to live by it. And who really have, and are empowered, and live by the very Spirit of God — they are the children of God, they are begotten of God. And they are the only ones that are the children of God, and God's Church, the true Church of God. The Church that Jesus said He would build is composed of those people that are the begotten sons of God; and being led by the very Word of God, the Way of God, the will of God, the law of God. They are the people that have — that keep the commandments of God and have the faith of Jesus; as you find them described in the fourteenth chapter of Revelation, and also in the twentieth chapter of the Book of Revelation, and all through your Bible, my friends. That's what Jesus taught, that's what He preached — that's in your Bible if you'll read it my friends. Oh, that isn't what you believed, that isn't what you grew up believing. No, but we are in a very deceived world and it's about time we wake up. So, listen; did the true Church of God of which Jesus Christ is the Living Directing Head then, did it become perverted and apostatized? No, because the people that apostatized — the people that turned away from the truth of God were no longer in the Church — if they ever had been in it. My friends, why do you have a Bible in your home when so many of you don't even know what it says; and you don't follow it and you don't believe it. I'll tell you why; the Bible is profitable to correct and reprove you and — now listen, honestly, how many of you really like reproval and correction? How many of you are going to really take it? How many of you really like it? Oh, you don't and you know you don't. The true Church of God has kept God's Festivals — not pagan holidays! It has been empowered with the Spirit of God. These things are new to most of you. I say you'd better throw away your prejudices and not throw away the truth. You'd better begin to look into these things and I say to you; believe only what you see in your Bible. And so far as it comes to actual factual knowledge of what has happened, believe what you read in reliable history; and check it closely. And believe the truth and verify it and study to show yourself approved unto God. God has given you a mind to study with; He's given you twenty-four hours a day to use; how do you use those twenty-four hours? Is there something else more important than knowing the destiny of life and eternal life? Are other things more important, crowding out the truth of God and what is going to happen to you for all eternity? You have eyes to read with, you have feet to walk on to a public library, or someplace to study, and you've got twenty-four hours a day. My friends, why don't you begin to use them in searching out the true values? I think we can begin to see that most of us haven't been putting our time to the best of use all along — now have we? Now that Church — spiritual organism, not a political organization — it's composed of all those whose hearts and lives have been changed. Yes, conversion means change, those whose lives have been completely changed by the very Spirit of God. Jesus Christ is alive, He is not dead on a cross, He is no longer hanging on a cross — why do we picture Him that way? Jesus rose from the dead and He is alive for ever more and has all power; and slays all power, controls all power in all the universe. God Almighty has given Him all power and all glory and He's coming in all that power and glory right back to this earth again; and your eyes are going to see Him when He does. And they turned away from the truth; they accepted Jesus and His name after they had crucified Him. And they proclaimed Christ, they 'accept' Christ, but His message; the way out of all this darkness and unhappiness — no; men love darkness rather than the light and want to stay in the darkness. What is wrong with humanity? Even in Paul's day many among those attending at these churches — Antioch, Ephesus, Corinth, and so on, Jerusalem — they began to apostatize and turn away from the truth. Division sprang up among them just as Paul said it would, right there at the Church at Ephesus. Those individuals, unconverted, or turned from God's truth and God's Way of Life, attending in those Churches, false brethren; right in the Churches as Paul said there would be. And there were already in his time, they were no part of the true Church though they visibly assembled, they were seen with the eye assembling, attending Church meetings with those who were in the True Church. Now the mystery of iniquity was already working as Paul said in his letter to the Thessalonians. Inside those visible Churches, even in that very first century, even in the very first generation that started out the Church. That apostasy then increased and by the year of one 125 AD the majority in most Churches, especially of those Gentile born that had accepted Christianity were continuing — now get this; those Gentile born, the majority in most of the Churches, were continuing in many of their old pagan beliefs and practices though they professed Christ and professed Christianity. Listen my friends; I think you can see just how it is. When we grew up we continued to do those things. And as the other young people grew up and another generation came into the Church — well; they were just a little more, shall we say, liberal minded, or 'broad' minded, you know what I mean, my friends. Now you know it, you've seen it take place right here today. My friends, that very thing took place in that Church back there. And by the year of 125 the majority of the Gentile people that professed Christ brought their Gentile beliefs, many of them, and their Gentile practices right into the Church, they kept on doing it. And finally, it became necessary for real Christians — who even as a scattered people — alone composed the true Church of God, to flee the jurisdiction of the government in order to truly worship God. And so, what was left was not the real true Church at all. The real Church was in the minority, and had really, by persecution, been forced out of the visible assembly until they weren't even there at all. And you find how they were taken care of in the wilderness and protected by God, outside of the jurisdiction of organized government for 1260 long years.